Named after the mythical resting place for Viking warriors who died in battle, the Valhalla Inn opened in the spring of 1963 at 1 Valhalla Inn Road, Etobicoke, just off Highway 427 and a few minutes’ drive from the new Toronto International Airport. 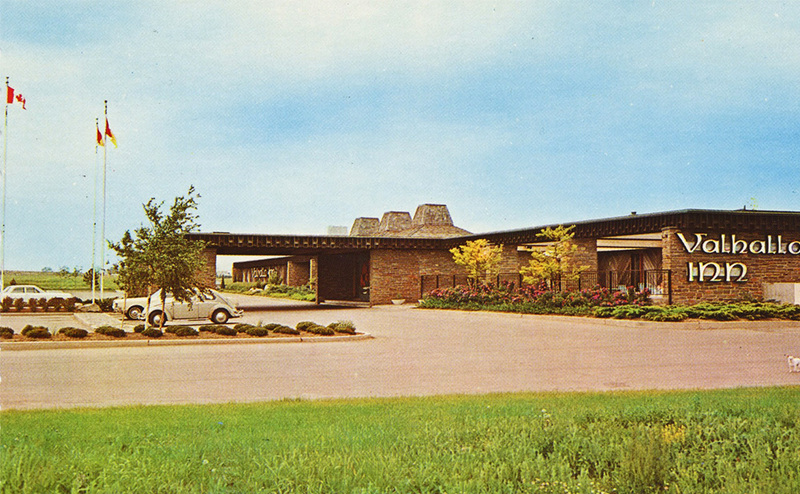 Closed in 2009 and now in the process of demolition, the Valhalla Inn exemplified the exotically-themed, high-style motor inn so popular during the 1950s, 60s and 70s. 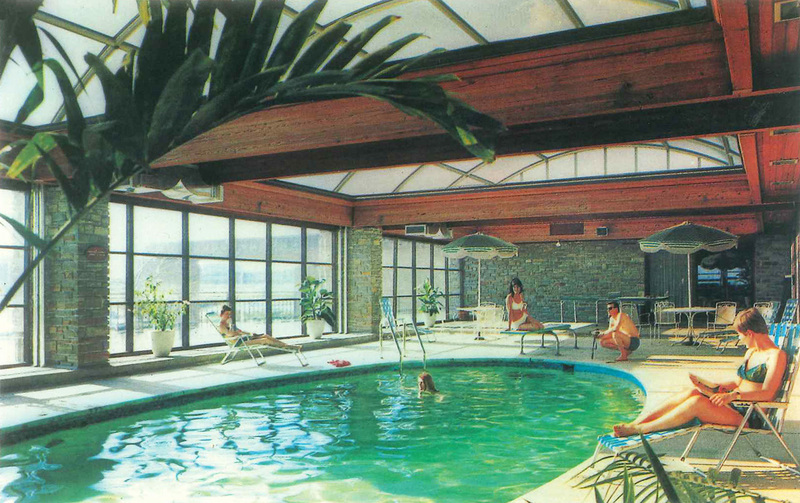 The Valhalla Inn was conceived when local builder Edmund Peachey, inspired by Viking longhouses and Danish Modern furniture while traveling in Europe, commissioned architect George Robb to design a Scandinavian interpretation of a motor inn. 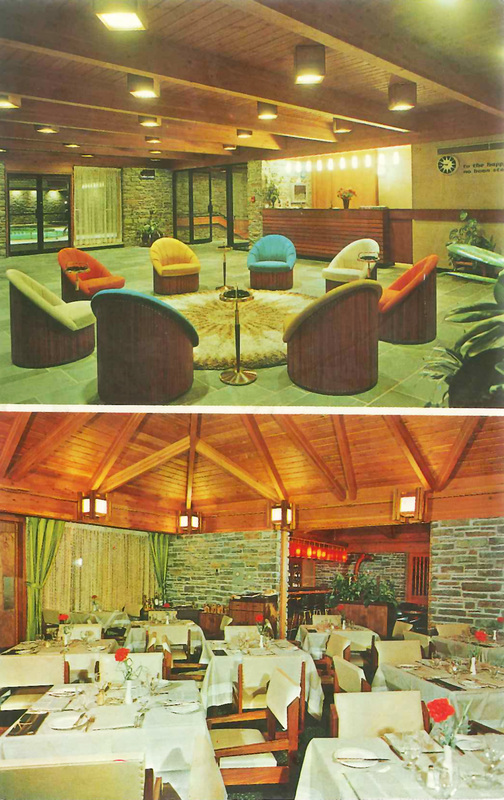 Beginning with a landscaped courtyard enclosed by low wings housing guest rooms, a fine-dining restaurant and a pair of cocktail lounges, Robb created a romanticized Nordic fantasyland amid the asphalt tundra of suburban Toronto. Exteriors were weathered cedar planks, Cooksville brown brick and rough-cut stone; a porte-cochere with monolithic fieldstone piers marked the main entrance. The Valhalla Inn’s trio of conical roofs atop the Nordic Dining Room, clad in cedar shingles, referenced traditional Scandinavian oasthouses and established a signature visual image for passing motorists. Finely-detailed wood fascia along the roof edge accentuated the building’s horizontal lines and produced delicate shadow effects. The courtyard garden drew upon the Canadian Shield as well as Scandinavian forests, with gnarled pines, native wildflowers and exposed rock jutting from the rugged terrain. A second south wing was added in the late 1960s and a 13-storey tower in 1977, completing the inn’s final configuration. Inside, past the massive teakwood entrance doors with sculpted bronze handles, the Valhalla Inn’s interiors were a warm, richly-toned mix of wood, brick and stone accented by bronze and copper. The walls of the Nordic Dining Room were cedar and fieldstone, the ceilings lined in Douglas fir with exposed timber beams. Overhead, natural light filtered down from skylights set into the peaked ceilings of the oasthouse roofs. 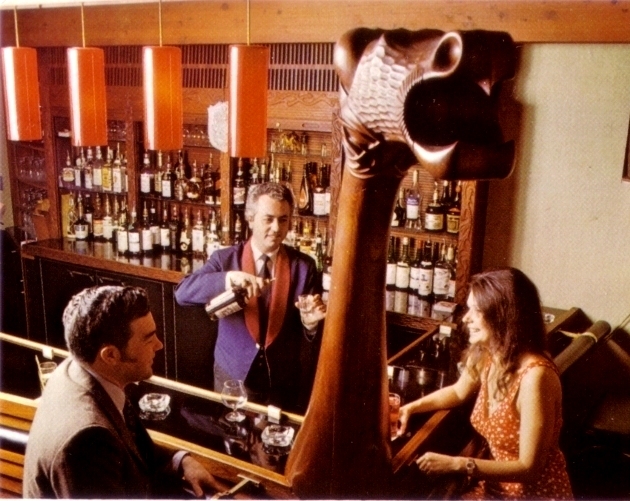 Most of the furniture and lighting fixtures were custom-designed by Robb, as was the Viking longship bar with its carved dragon head holding court in the adjoining Nordic Lounge. 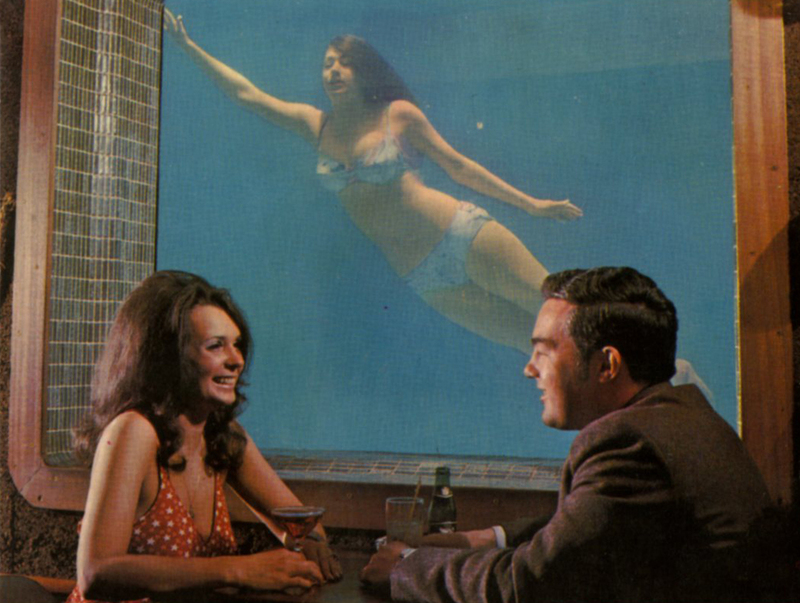 Down a few steps was the Mermaid Lounge, where portholes behind the wraparound bar offered underwater views into the swimming pool. Patrons could sip their Martinis and Manhattans while young women in mermaid costumes languidly swirled about the luminous waters. Set to replace the Valhalla Inn are the One Valhalla Towns and Condos, a complex of 68 townhouses and three glass-walled residential towers of 22, 30 and 35 storeys rising from a landscaped podium. But not all is lost; in consultation with the City of Toronto’s Heritage Preservation Services, the developer will incorporate the famed longship bar and other interior elements into an amenity room upon the podium, which in turn will be topped by a full-sized recreation of the iconic oasthouse roofs. George Robb (1923-1991) is best known for his 1955 Shell Tower (later the Bulova Tower, demolished), for many years a landmark on the CNE grounds. Other notable projects are the Old York Lane retail laneway in Yorkville, the Guildwood Village Church in Scarborough, offices for the Beaver Lumber Company and subsequent Valhalla Inns in Thunder Bay, Kitchener and Markham. In addition to his architectural practice, Robb taught generations of students as an associate professor at the University of Toronto’s Faculty of Architecture from 1948 to 1984. His firm, founded in 1952, continues as George Robb Architect. I grew up the neighborhood at 345 The East Mall. Edmund peachy was head and shoulders above the builders of today and a definate leader amongst his peers. I met the MAN as a child of 7 years old and could tell some true stories of not only what he had built BUT also of the caliber and carachter of the people employed by VALHALLA company. We honeymooned there – what a great time!! !